This interview takes a look inside the systems and processes driving the successful content marketing efforts of leading architecture firm, DLR Group. 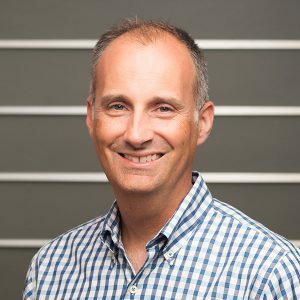 I recently chatted with Andy Ernsting, Principal and Brand Communications Leader for the integrated design firm, DLR Group about the firm’s content markering efforts. DLR Group is one of the 25 largest firms in the U.S. Andy was kind enough to give us a peak inside the systems and processes his team uses to drive their efforts. More specifically, we talked about the firm’s flows of knowledge and information that make it all happen. Q. When did you launch the current iteration of the DLR Group website? What was your vision for it? A: When I joined DLR Group, I was tasked with forging a single brand out of our mix of offices and practice areas. At the time, we tended to function like 14 separate islands, and my charge was to unify the firm as a single brand. The website was just one piece of that broader vision, but it was a really important one. Our old site was like a museum. It was built on a custom CMS that was very hard to use, very hard to update, and highly restrictive in terms of what you could or could not do. The pictures of our work were tiny. But, most importantly, it wasn’t at all an effective representation of our firm or our brand. It didn’t capture or present our culture or our people in an intelligent and compelling way. There was no way for a client to establish a relationship with the people inside the firm. The vision for this current iteration of our site was really to fix all that. To bring the culture of the firm to life. To show our people. To convey our brand personality. To show how we think and what we do. Ultimately, we wanted the site to present an equal representation of people and projects. Q. What were some of the hurdles towards accomplishing that? A: To start, we had to change the way we thought about ourselves. We’re more than a collection of buildings. We’re people. A client doesn’t hire buildings. They hire people to design buildings. Whether it was a new business meeting, a presentation or a story on our website we wanted to get past the project. Get past the square feet. The people who are in it everyday. The people that go by it everyday. And, the community around it. We had to get our entire culture thinking this way. We had to get people thinking beyond the simple idea of designing a building. Ultimately, we captured this in our brand promise — To elevate the human experience through design. Once people got that message, everything else that needed to follow became much easier. Q. You made a strategic investment in knowledge management as a pre-cursor to driving external content for your marketing efforts. Tell me a bit about that initiative? A: One of the key drivers of our growth over the last 20 years has been our strategic visioning process. Every 5 years we develop a 5-year strategic plan. It functions like a North Star — defining who we are and where we want to go. When we started the Vision 2015 process in 2009, one of the big ideas we wanted to achieve was the creation of a rich knowledge sharing platform. We wanted to get individual knowledge off people’s desktops, servers and brains and make it institutional knowledge. Again, my charge was to forge a brand, and we recognized that in a firm like ours, knowledge is a critical component of that. Every organization has this challenge; it’s not unique. People are often recreating the wheel — they don’t know where to go for knowledge or they’re moving so fast they don’t see the value of sharing the knowledge. At the time, I was in the unique position of being able to travel around the country and visit each one of our offices. I also was able to meet with the leaders of each of our markets. And, they were all talking about the same challenges. It was very simple, really. We needed to create a place where we could access, share and push out all the knowledge from across our firm. Eventually, we connected with the folks at Knowledge Architecture, and chose to invest in their knowledge management platform, Synthesis, as part of that effort. We launched our internal platform, Square1, on that technology, and it’s been central to our content model. We’re constantly encouraging internal knowledge sharing through Square1 — share your work, share what the client asks you, share what you saw at the conference, share your awards, share your new hires. And, from that we’re mining the dialogue for the nuggets we can develop into deeper external content. Q: From the outside looking in, it appears that your content engine really started to hit its stride around May 2014 (about 4 months after your new site went live). What was happening in the firm at the time that made things start to click? A: When we launched the site, we had 5 years of thought leadership material in our pocket. It was spread all over the place — bylined articles, presentations made at national events, you name it — but, it was there. It just had never been repurposed and pushed out to the world. We used a lot of that content as our launch inventory. Once we went live with the site, and our internal thought leaders could see how we were repurposing this material the lights started going on for them. They understood what we were looking for. We’re not looking for white papers or 2,000-word bylined articles. All we’re looking for is a simple insight — one idea with 3 supporting points and 3-400 words. That’s all we need. The day of the white paper is dead. Hardly anyone is going to read a 20 page document with footnotes anymore. You can write that and break it into chunks and repurpose it for the next 8-10 months. Once they saw this, the idea of content marketing wasn’t as daunting to them. They saw that you really can write an insight on the plane ride back from Minneapolis or on a trip to L.A. New content became much easier at that point. Q: Did people just start to participate and contribute or did you have to push them along? A: We did a little bit of both. Shortly after launch, they started to understand what we were talking about. I did a presentation at our principals meeting in Phoenix in October to just reinforce the simplicity of what we’re looking for and offer some suggestions on how to go about it — insights come from all the stuff you’re creating already. 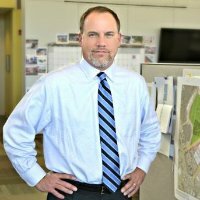 If you’re working in the retail environment and you get an RFP from a developer who wants to renovate a mall, one of his likely questions is going to be, “How do you keep the stores open while the renovation is happening?” You’re going to answer that question in the RFP anyway — there’s your insight. We talk a lot about repurposing things. Giving content you’re already producing a new life. Q: What does the editorial strategy look like at DLR Group? How do you go about identifying topics and authors? A: We have a master editorial strategy and we produce a marketing communications plan for each one of our core sectors — each plan includes insight development. Ultimately, the plan is what creates bandwidth for people. A plan isn’t what you’re going to do, it enables you to say no to doing things that pull you away from your stated objectives. Q: What does the planning process look like? A: We have a core group of communications people working directly with each of our key markets. Every year, I task them with identifying 8-10 topics we want to talk about, fleshing them out, narrowing them down and assigning people to write about them. From there, they work consistently with the leaders of those practice areas. They have strategic calls every 2 weeks. And, one of the agenda items is to talk about their insights calendar. The goal is to ensure that if someone’s assigned a topic, that they have it on their calendar. As we go through the year we also have organic stuff that bubbles up and becomes an insight. The general goal is for every one of our core practice areas to publish a minimum of once per month. For our larger practices we have 5-6 people sitting on that core team across the country. We’ll work with them and support them in whatever way necessary. Some people will give us 500 words and we distill that down. Some people will give us an outline and we’ll ghost write it. For others, we’ll get on the phone, conduct a short interview, and write it for them. Q: Let’s talk a little bit about the flow of information through your firm. A: Deltek Vision is really the heart of everything. My key message to internal teams is, “Vision is the source of absolute truth at DLR Group.” Just about everything you see on our site — every word, every piece of data, every bio, every project detail is straight out of Deltek Vision. Project photography is stored in OpenAsset, and streamed to the website. The only thing, really, that resides exclusively in the site are the insights themselves. We update the project narrative inside Vision and it flows directly to the CMS. This makes the project leaders responsible for ensuring that the data inside Vision is accurate. It allows us to have the same message and the same data in all our systems (our internal knowledge sharing platform and DLRGroup.com). Q: Besides the obvious efficiencies and accuracy of information, how has this helped you? A: Historically, getting the knowledge out of people into the system was a challenge. Getting information on a project into Vision was difficult. Getting photography into OpenAsset so the rest of the firm could use it was difficult. That part of our ongoing challenge has improved. People are getting their images into OpenAsset so their projects can get to the website faster. 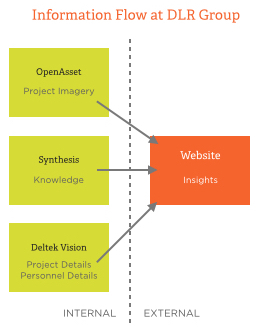 Your project cannot get to the website until the key project data is documented inside Vision and the project images are posted inside OpenAsset. Once you do those things, I can have a project up on our website in 10 minutes. Q: As a firm, you’ve been consistently producing useful content on your site for about 14 months now, what results have you seen from that effort so far? A: It’s working. We launched in February. It took us a little while to get our sea legs under us. At the principal’s meeting in October, I re-emphasized the importance and value of LinkedIn. We need every leader to have a current LinkedIn profile. All we’re asking people to do is to take some of the insights that we publish to the website and share them on their LinkedIn page. Essentially, we’re creating 600 mini-websites to share our story with people who know us and trust us. Our traffic went up exponentially. We are receiving inbound requests for new business, for calls, for articles. Some of those have been very significant opportunities. To my pleasant surprise, the quality of the requests have been very high. We may not pursue them all, but the quality is much better than I expected in this small amount of time.